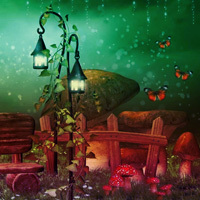 Games2Rule - G2R Fantasy Forest Hamlet Escape is another new point and click live escape game from Games 2 Rule. In this game, you came to to see the beauty of fantasy forest hamlet. But unfortunately, you missed the way out. You have to find the way to escape from there by finding useful objects, hints and solving puzzle. Click on the objects to interact with them and solve puzzles. Good Luck Have Fun! In the scene with the big blue bird pay attention to the shiny ball to the left. Put something there. stuck with hammer, sword en fork, how to release the bees? I am stuck in second set of scenes. I am missing 1 pink lapwing and clues for 4 3x3 grids and for 4 red symbols in moon-door scene. are bees the hit for the order of the lanterns? Ingrid, yes, but you need to touch the glass with green sword. Where is the clue for the green and blue birds (left/right)? blue and green birds in scenes. just try all blue left and green right, if that doesn't work try other way. cant remember. I'm missing a pink moon shape..
blue bean thing shape for green sign for butterfly's..4got I had it. firefly on things under butterflies. Thanks everyone. Pretty good game. Need hint for swings. Still have hammer and missing 1 big flower. What is with the 3 flowers? I can't match them with the clue on the hearts. And I still have the hammer. click on the color on sign then the flower below. can't remember the clue. Thanks for a good game, G2R.